While many of the options in the compact sedan class have gone all high tech and expensive with their new versions, the 2014 Toyota Corolla has been refreshed in a way that improves it in pretty much every way – but without going overboard and jacking the price way up so prospective consumers can get everything that they expect and nothing that they don’t want to pay for from this new Toyota sedan. The Toyota Corolla has been one of the bestselling cars in America for years so when the Japanese automaker announced plans to introduce a new generation of the Corolla, the American market paid close attention. When Toyota rolled out the striking Furia Concept at the 2013 Detroit Auto Show, we were excited at the thought that this angular, high tech looking compact concept becoming the next Corolla – although it was pretty clear that the production Corolla wouldn’t be anywhere near as sporty or aggressive as the Furia. When the 2014 Corolla debuted with a look that was very similar to the Furia – except with some necessary calming of the more aggressive aspects and the removal of some carbon fiber bits – it was quite a surprise. The Corolla looked sharp on the outside, it featured more technology on the inside without going crazy and it packed the same predictably efficient 1.8L engine that was used in the previous models so on all accounts, it appeared as though he company had made a collection of smart moves in reworking the Corolla for 2014. However, the Toyota Corolla is a leader in an uber competitive segment where many of the newer entries are packed with high tech – and high priced – features inside and out. This has pushed the price of many compact sedans into the range of many midsized models and while many of those goodies were available in the Corolla, they weren’t made standard so unlike many of the competitors, the Corolla offers many of the features that you can get from the competitors but the new Toyota does it for a friendlier price. While the likes of the Honda Civic, the Hyundai Elantra, the Ford Focus and the Chevy Cruze have gone a touch more upscale both in features and price, Toyota has worked to keep the Corolla a great budget option by only introducing the items that buyers really want. That plan has worked nicely. 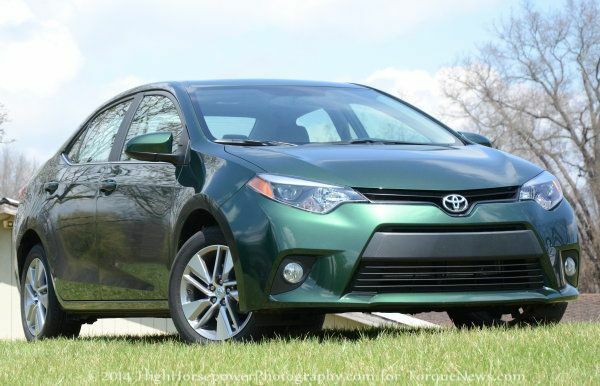 My 2014 Toyota Corolla was fitted with the LE Eco Plus trimline, which carries a base price of $20,605 including destination while the Moonroof/Driver Convenience Package adds $2,360 for a total price as tested of $22,570. When Toyota showed off the Furia Concept at the 2013 Detroit Auto Show, we had high hopes that the next generation Corolla would be as strikingly sporty as this concept sedan. With the Civic, Elantra, Dart and Focus going to a far more aggressive look with their latest versions, we expected the Corolla to follow a similar route. The production Corolla that I spent a week driving had the obvious styling cues from the Furia, but it did away with the most aggressive features that would be a bit too much – and a bit too expensive – for the 2014 Corolla. The result is a 2014 Toyota Corolla that looks enough like the Furia and enough unlike the previous Corolla that this new design was a big step in the right direction. It didn’t pack the super aggressive front and rear fascias, the headlights that basically cover the entire front end or the random carbon fiber here and there, but the new Corolla sports the same face as the Furia. This includes a front fascia that flows up to the small upper grille with the black filler contrasting nicely against the dark metallic green paint. The angular headlight look of the Furia has been retained but in a bit more mild form, with an angry look created by the nicely sculpted headlight internals. The front end isnt as aggressive as the Furia, but the look is there and what did make it to the production 2014 Corolla made for a much better looking small sedan. Out back, the 2014 Toyota Corolla doesn’t have the huge carbon fiber low fascia piece, the excessive molded exhaust tips or the super high tech LED taillights, but the shape of both the back end and the taillights from the Furia have been well maintained on the production Corolla. While I would have loved to see a rear fascia a touch more similar to the concept, this new rear end is another big step in the right direction that helped to kill the vanilla reputation of the previous Corolla. The 2014 Toyota Corolla isn’t as cutting edge as the Furia Concept, but we knew when that concept was introduced that the company wouldn’t be able to pack that much sporty styling and that much carbon fiber into an affordable compact sedan. Even without the pricey features of the Furia, the 2014 Corolla has an exterior design that allows it to more closely compete with the sportier entries in the class and it does so without sending the price of the Corolla through the roof. It’s not the Furia – but it is a much cooler Corolla than the prior models and that is a big deal in the modern US market. The 2014 Toyota Corolla LE Eco Plus is a upper mid level trimline, but you won’t find an exorbitant amount of high end features like leather seats, high tech gauges or a thousand dollar touch screen. What you will find it a touch screen that is small but gets the job done, proving easy access to the sound system, the hands free phone system and the navigation software. There is a small information screen in the gauge cluster that tells you the various trip mileage and fuel economy info along with an analog tachometer, speedometer and fuel gauge. There are also some very simple controls on the steering wheel for the phone system, the voice control system and the radio for those who like to keep their hands planted on the wheel while driving while those drivers and passengers who don’t like touch controls can rely on a small group of traditional buttons and knobs to make adjustments to the sound or nav system. Below the small yet functional touch screen is a heating/air conditioning control panel that has a digital readout but other than that, the system is as simple as it gets. For some people, that will be a nice change as the Corolla doesn’t have the overly difficult controls just to get the AC on in hot weather. While there is some leather trim on the steering wheel and across the top of the dash, the seats of the 2014 Toyota Corolla LE Eco Plus are wrapped in two tone and dual texture cloth that isnt fancy, but the seats are comfortable whether you are driving across town or across a few states. The light colored upholstery combines with the light colored portion of the dash to provide a sharp looking contrast against the many black trim pieces inside with a spread of silver finishing off a simple, yet good looking interior. Most importantly, the 2014 Toyota Corolla has plenty of seat space for the driver, front passenger and rear passengers. While some compact sedans provide plenty of front leg room at the expense of rear leg room, the Corolla offers a nice amount of room for the rear passengers and the folks up front. For the folks up front, there are really no complaints in terms of seating space even for very tall drivers or passengers while the outboard rear riders have plenty of leg, knee, hip and elbow room, but the head space can get to be a little tight for someone over 6 feet tall in the back seats. I also wouldn’t put anyone other than a small child in the middle seat, but this car offers ample space for a young family of four to get from point a to point b with plenty of space in the trunk for cargo. The 2014 Toyota Corolla doesn’t have the world’s biggest touch screen, a stadium quality sound system with speakers that light up or leather seats that heat up, cool down and rub your back – but it does have all of the features that you would expect from a modern compact sedan in a cabin that has plenty of passenger space in the front and rear. The Corolla LE Eco Plus won’t blow you away with gadgets, but it also won’t leave you wishing that you had spent more money. the 2014 Toyota Corolla LE Eco Plus is powered by a unique 1.8L engine that delivers 140 horsepower and 126lb-ft of torque to the front wheels by means of a Continuously Variable Transmission (CVT). This package is expected to yield fuel economy figures of 30 around town, 40 on the highway and 34mpg combined – numbers which I found to be very accurate during my drive time in the new Corolla. I averaged 34.6mpg over the entire time driving the Corolla with a pretty even mix of city and highway driving, while being very willing to return 40mpg when cruising on the highway. Having driven a collection of cars in this segment, I found the new Corolla to be one of the most fuel efficient without requiring me to drive like a little old lady. With 140 horsepower and 126lb-ft of torque, the 2014 Toyota Corolla is far from the most powerful car in the segment, but considering that this is a segment in which most prospective buyers arent looking to tear up the racing world – the lower power numbers really don’t matter. The good news is that while the Corolla is no race car, the combination of the available power with the CVT transmission affords the compact Toyota sedan solid acceleration from a stop or on the highway. It might be one of the less powerful cars in the segment, but it doesn’t feel underpowered under any normal driving circumstances so you won’t have any real problems accelerating to merge into highway traffic or simply pulling out of your subdivision during that annoying morning rush hour traffic. I am typically not a fan of the Continuously Variable Transmission (CVT), but Ive said before that Toyota does CVTs better than any other automaker and the transmission in the new Corolla is no different. Sure, you get the often frantic revving of the engine as the transmission works to keep the 1.8L mill within the peak portion of the powerband, but the Toyota CVT is far refined compared to other CVTs in compact cars around America. In the long run, the benefits of the CVT far outweigh the downsides so while I would usually prefer a traditional automatic transmission (or better yet, a manual transmission), the CVT in the Corolla does a good job of balancing refinement with efficiency. In terms of road handling, the 2014 Toyota Corolla offers similar qualities to what you get on the acceleration end of performance. The Corolla offers a smooth ride around town and on the highway with a touch of road roughness and noise making it into the cockpit – but it isn’t an excessive amount of harshness nor is it enough to stand out relative to other models in the class. I would put the Corolla in the middle-to-top portion of the segment in terms of ride quality while being soundly in the middle of the segment in handling. The Corolla can cut through the turns on back roads with some urgency, but pushing the car a bit too far will get it sliding around in a fairly undesirable manner. If you try to really get to cutting hard through traffic at higher speeds, the Corolla as at its weakest and it makes it readily apparent that blasting down a curvy highway at higher speeds was not one of the concerns of the engineers. The Corolla is far from the worst handling compact sedan, but it falls short of really competing with some of the cars in the class which focus on sporty handling to offer really strong driving dynamics. As is the case with the power, the Corolla isn’t great at hammering the corners but it also isn’t terrible and that is the case on the highway as well. Most importantly, it handles well in normal driving circumstances and since I expect that very few prospective Corolla owners will ever want to push their car as hard through turns as I did – most buyers won’t ever notice any downfalls in the handling capabilities. What the 2014 Toyota Corolla does do well is provide a smooth, quiet ride on almost any situation. The Corolla isn’t a sport compact and Toyota doesn’t make any claims to the contrary so if you are shopping for a compact sedan that handles like a sport model, the Corolla probably isnt for you. There are other cars in the segment that have more power, better acceleration and more confident handling under speed, but those cars are also more expensive and less efficient so if you want a great daily driver more than you want a compact that you can rock through a twisty canyon road – the Corolla should prove to be a great option for you. The Toyota Corolla has long provided American consumers with a super efficient, affordable compact sedan and with the new 2014 model, the Corolla offers more technology inside and out but the Japanese automaker has improved their popular compact sedan without sending the price through the roof. You might not get as many high tech gadgets inside or as much power as you do with some of the other options in the class, but for those prospective consumers who aren’t concerned with having a whole bunch of power or the segment’s most impressive infotainment system – the 2014 Corolla is a great option with a great price. If you are looking for a compact sedan with tons of flash and flare along with a big, powerful engine, the 2014 Toyota Corolla may not meet all of your requirements. If you want an affordable, roomy compact sedan that offers great fuel economy, solid power and a infotainment system that features HD radio and an easy to use navigation system – the 2014 Corolla could be the ideal new car for you. I have had my new Corolla for about 2 weeks and have averaging 38mpg with combined city/highway, so cannot wait to take long road trip to check out actual highway mileage. I am also a Camry owner so am very happy with the ride of the Corolla. I drove every form of the new Corolla and my favorite is the LE Eco. Although I like the "S Plus" for its better looks, the LE Eco is so advanced for such an incredible price it would be my choice. Oh- and I'd get the base wheels which provide a better ride and better mileage than the upgraded alloys. Great review. Personaly I really like the Auto mode but you could always use it manually like any other system : set a temperature with the dial and choose the function, vents and fan speed. If you press "auto" the system will simply decide the "best" way to maintain the set temperature : which vents, which fan speed, AC or not, recirc or not. In winter, it will not blow much until heat is available from the engine (I find my LE Eco is on the slow side with that... plus I have to set temperature a bit higher than desire, say 23C to feel 20C) then the fan speed will increase - sometimes to max - and decrease by itself to maintain the temp. If you hit any button (say defrost), auto disengage until you press auto again. AC will engage even in lower temperature while heating - but never below freezing - as a dehumidifier. You can disengage this automatic function via "vehicule setup" on the touchscreen. So basically I always leave it on Auto (except for the occasional defrost) and it does all it has to do to keep the cabin at the set temperature.